Through the deal, the Meadows Community Association will purchase half of the Sarasota, Fla., club’s $6 million debt. The club will still be $3 million in the red, but the sale of 32 acres of club-owned land around the clubhouse and across the street for residential development is likely. The Meadows Country Club in Sarasota, Fla., has been drowning in debt that now totals $6 million, facing potential bankruptcy and foreclosure. But the Meadows Community Association is throwing the club a life preserver in the form of a $3 million purchase of the club’s bank debt—still to be finalized, possibly this week, the Sarasota Herald-Tribune reported. This win-win situation saves the club and provides the association a higher return on investment from deposits into the reserve fund—from the current 1% on certificates of deposit and such to 5% on the mortgage loan to the Meadows Country Club, the Herald-Tribune reported. “The Meadows Country Club and the Meadows Community Association working together is in the long-term best interest of the club and the community,” said General Manager Andrew Kingsley. The club will still be $3 million in the red, but the sale of non-course but MCC-owned land around the clubhouse and across the street—32 acres—for residential development is likely, the Herald-Tribune reported. That meeting, though, brought the financial straits of the club into broad community awareness, the Herald-Tribune reported. The association does not own the club—members do, with a private management company, Billy Casper Golf, in charge of operations for the past two years instead of club employees, the Herald-Tribune reported. Besides golf, the club features a tennis center, a pool complex, a fitness center, and a combination of casual and formal cocktail/dining facilities. 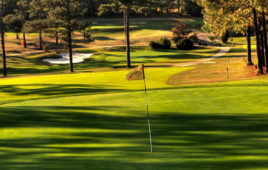 The acreage of the three 18-hole courses provides valuable green space as does other open land in the community, which features more than 80 lakes and waterways, a 1.7-mile fitness trail, 14 miles of sidewalks and bike trails, and two butterfly gardens—all of which translates into strong property values. Two of the three courses are open to public play, the Herald-Tribune reported. The Meadows also contains a small shopping village and two nursing homes, the Herald-Tribune reported. Some 18 months ago, community leaders and residents began developing a strategic goal called the Renaissance Plan. The 40-year-old development had only been maintained over those decades. The assessed value of just the homes in The Meadows stands at $577 million, Coyle said. When homes go on the market, they sell quickly. Had the country club descended into bankruptcy, the community would have faced a $144 million loss of property value, the Herald-Tribune reported. The original developer promoted a lifestyle, and the houses were secondary. “We realized we, too, should be promoting our amenities and our lifestyle, and a big piece of our amenities are the golf and the tennis and things that are provided by the country club,” Coyle said. “So a good deal of our property value is coming from our amenities,” including the “green vistas” that the golf courses provide. “So what we’re doing is taking a page from that and trying to go back and re-create and enhance the lifestyle vision for all the residents in the community,” Coyle said. “And that’s bringing us and the country club closer together. The MCA has control of housing units with the many restrictions, covenants and entitlements, thus builders have to cooperate with the association. “The way you could lose control is to go into bankruptcy court,” she said. But the club and association are working on implementing the Renaissance Plan to both help the financial stability of the club and enhance property values for property owners, Coyle said. “We are now working on that vision and mission,” she said. That includes the overall revitalization of The Meadows with home improvements and updates as well as community upgrades, the Herald-Tribune reported. Today, total golf membership stands at 351, Kingsley said. Residents are kept in the loop about the association’s strategic plan and other progress via emails, the community’s monthly Meadoword newspaper and board presentations at homeowners association meeting, the Herald-Tribune reported. “We are really committed to maintaining what one of the things that makes us unique—50 percent green space and mature trees,” Coyle said. “We’ve had extraordinary support from the community.